Please note that you must have a data plan and an unlimited data plan is highly recommended to keep you from incurring additional connection charges. Requirements: Any bluetooth enabled laptop and cellular phone should do, however, the steps below have been verified to work with Windows XP (Professional with SP2) running on the Dell Latitude D620 and Inspiron 1501 (Bluetooth Stack for Windows by Toshiba v.4.00.22(D)SP2) and the Nokia E62. 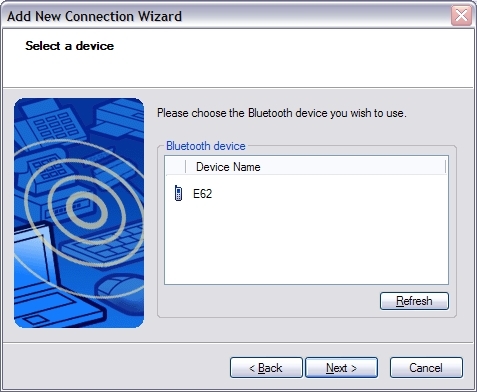 Right click the Bluetooth icon in the system tray and choose "Add New Connection"
Your laptop will scan for nearby Bluetooth devices and display a list. Choose your device (E62, in our case) and click "Next"
Laptop will ask for an authentication pin, make up a number and provide it (e.g. 1234) and click next, your phone should pop up an authentication box, provide the same code and choose to accept the connection. In the box that follows you should have your phone as the connection name and *99# as the phone number. I turned off the "Set as Default Dial-up" option because I want to control when to establish this connection rather than let Windows control that. To get the status of your connection (such as bandwidth used), place your mouse cursor over the network icon. To disconnect, right click and choose "Disconnect". That's it, you're all done! Now you can get an Internet connection wherever you have a cellular singal.